Guy Poskitt in one of his fields of wheat at Kellington. Working with leading supermarkets, employing and empowering the right people and introducing new technologies have been cornerstones of Guy Poskitt’s farm business success that today sees him growing substantial acreages of carrots, parsnips, potatoes, sugar beet and cereals and supplying Asda and Aldi with vegetables from his farming base at Kellington between Goole and Selby. Guy is justifiably proud of his team’s achievements and how the enterprise has developed since he returned early from his university studies at Newcastle 35 years ago. 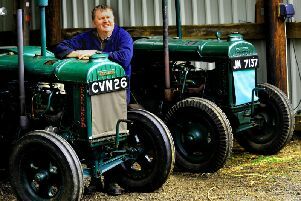 He’s won farmer of the year titles, his fleet of Poskitts carrots trucks are a common sight on the road in Yorkshire and further afield and he’s a confident man who understands his market place, but he’s also currently feeling somewhat stymied by Brexit. It’s particularly relevant to his operation as he has around 250 non-UK employees. Carrotts progressing on the lines at Poskitt's at Kellington. “I’ve always enjoyed the trading of vegetables having started with carrots on the wholesale markets. It was the carrot business that has enabled the growth of the rest of the arable side and I could still tell you the phone numbers of our customers in markets at Leeds, Bradford, Castleford, York, Hull and others today. “Sadly, the wholesale markets business isn’t what it was, but I’ve had some great times with the wonderful, colourful characters and loved the craic and going along to the market dinners. “Our trade as a direct supplier to Asda started around 20 years ago and despite some farmer friends telling me I was doomed trading with a supermarket it’s done me no harm. The people who have taught me everything in business are the retailers. Their focus is always on the customer being number one. We now also supply Aldi. All retailers want are suppliers that offer them great value, whose goods turn up on time and businesses that don’t let them down. If you want to sell in any kind of volume you have to be with them. They need us, farmer suppliers, it isn’t a case of us and them. “My father passed away when I was just eight years old and to my mum’s eternal credit she ran the farm until I was 20. She was the kingpin of what was a traditional arable farm of wheat, barley, potatoes and carrots that we supplied to Lockwoods for canning when canned carrots were popular. Tackling the running of the farm at a young age was good for me because when you’re young you’re brave, have lots of ideas and don’t see problems. That’s how it worked for me. Migrant workers sorting the parsnips at Poskitt's. “I enjoy being a farmer and we have several share farming and contract farming agreements in addition to our owned and rented land. Growing carrots represents 20 per cent of the land we farm, but creates 70 per cent of the value. “We grow Nairobi carrots, which make up 75 per cent of our total carrot harvest and has been the most popular carrot variety for decades. Parsnips represent 5 per cent of the land we farm and makes up 15 per cent of value. Guy’s concern over what will happen to his non-UK labour is currently the rather large fly in the ointment to his progress. “Brexit has put a brake on our business as we’re in limbo over the issue of migrant labour. It has created uncertainty for the business and for the loyal, hard working people who work with me from Latvia, Estonia, Poland and other countries some of whom have been with me for years. “When I had a meeting with Michael Gove at the Great Yorkshire Show I made my point that if we have no migrant workers it equals no business for me – and that’s the same for others in sectors such as hospitality and health care, as well as horticulture, fruit and vegetable growing. “There is uncertainty everywhere and I feel for my team and their families. What happens to those who have settled here who may have a teenage son or daughter who wants to work in the UK and have been brought up here? “I was an avid ‘remainer’ and I still can’t understand how we will be better off by being out of the EU. At the moment all it seems to have caused is heartache and the fallout could prove probably our biggest challenge. In the meantime, Guy is doing his best to carry on as normal. Teamwork and technology are two of his key areas. “Motivating people isn’t just about what you pay, it’s about those involved having ownership of what they do and feeling good about themselves and their contribution. Guy is a past NFU county chairman and national chairman for the NFU’s horticulture and potatoes board. He’s a representative on the board and believes the NFU has an important role to play especially at present.